Happy, happy Friday! Only a few more hours of work stand between me and another Penn State weekend. As usual, I’m excited to be heading up to State College to watch PSU take on Iowa under the lights. But today is also another important day – the beginning of the 20% off at Sephora for VIB Rouge members! I have an on-going wish list of items from the beauty store, so for today’s Five on Friday I’m sharing what I really, really want this time around. Right now I’m using a cheap hairdryer from Target. It works, but it’s slow and bulky. I haven’t actually held the Drybar dryer in my hands, so sadly, I don’t have a true idea of its size and weight, but it gets great reviews. The included curling iron, brush, clips and styling spray are all items I would absolutely use, too. Even with the 20% off I’m not sure I can justify this price tag, though. I had my foundation done at Sephora last week and the makeup artist used this spray to finish off the foundation. My skin is so incredibly dry and peeling (Already! We don’t even have the heat on yet!) and this spray added some great moisture without ruining the makeup. I’d love to get one to stash in my office at work and another to keep at home. I freaking love blush. It might be my most favorite makeup product, seriously. And Tarte is my current favorite brand for blush. The colors and pigments of the Amazonian Clay products really are as great as the reviews say. This colorful palette is definitely getting added to my cart! Again, with the dry and flaky skin! I have the Fresh serum but I’d love this to layer over top at night. I currently use the Ahava daytime moisturizer, which I highly recommend, but I’m looking for a nighttime option. Fresh is such a great brand, too. People went absolutely batshit crazy over these palettes last year; I swear I saw them on every blog and every YouTube channel! The price is so, so steep for shadow, in my opinion, but it’s on my wishlist in the neutral and cool matte options. It’s too much, though…right? Someone needs to talk me down off of the eyeshadow ledge. I already have some great palettes and I’m not an every day wearer of shadow, but they’re so pretty! Decisions, decisions. 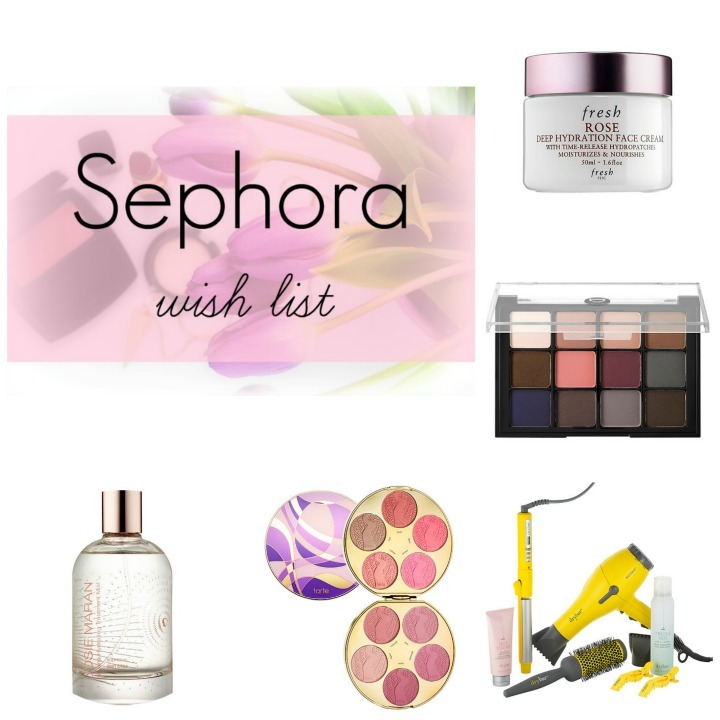 So those are my top five Sephora wish list items. Is there anything I’m missing? Have you tried anything on the list and loved/hated it? Recommendations are always, always welcome!